This story about postpartum depression following a premature birth was submitted by Sara from Growing as a Mom. Premature deliveries can be incredibly stressful on new moms. In addition to healing from labor, new moms now have to worry about a baby with additional needs, and often miss out on precious bonding time in the early stages. Read Sara’s story of how she had a difficult time adjusting to life with a new baby. 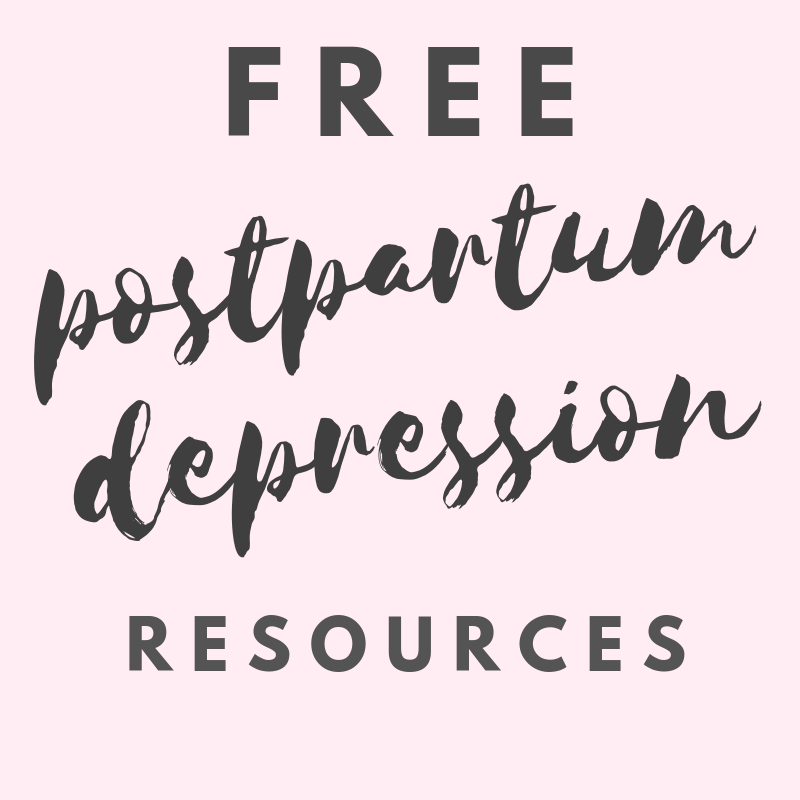 She also includes some helpful tips and advice for managing postpartum depression. The best way I can describe depression and anxiety disorder is like a dark, black, sadness filled hole where the light at the top represents everything your life is not. You keep climbing yet sinking deeper and deeper…. until you think this new way of living in this dark hole is just normal. The days were monotonous, my energy level was so low. I wasn’t eating, I was barely showering and full days went by where I did not get any fresh air. I started to have really bad anxiety. Because of my son’s labor and delivery, I had constant panic about his well being. I also had no clue what I was doing as mom despite constant googling on the matter. Every sound he made, every small cry, was like a dagger straight to the heart. I couldn’t possibly protect him from everything, therefore something awful will inevitably happen to him so why even wait for that to happen? If anything happened to my son I would just kill myself. I was blessed to have my amazing and supportive husband, but had no one else. I tried to hide my depression and anxiety from my husband, knowing he was tired too. My son was premature and was taken to sick kids hospital right after birth. This traumatic experience would take a year to begin healing from. Plus, because of this separation, breast feeding was awful. My milk wouldn’t come in plus the hospital staff already had Titus used to bottle feeding. My physical condition was a nightmare. After my 40 stitches I was confined to a wheelchair for 4 days after delivery. I felt useless, exhausted and overwhelmingly sad that my son had to go through this. I could not look at him connected to his IV without completely breaking down. After 5 days my husband and I got the amazing news that Titus could come home. We were over the moon. We put his tiny body in his huge car seat and set off. Once we got home, reality set in. No nurses to help with feeding. No supervision so my husband and I could sleep. Titus was one of those perfect angels that only slept in 40 minute stints. We continued to struggle to breast feed. Usually ending in both of us crying while my husband went to warm up a bottle. Baby crying, breast feed attempt, bottle feeding, diaper change, more breast pump, baby crying, etc. etc. went on for weeks. Sleep deprivation, poor appetite, stress and worry and constant “being on” takes it’s toll. For some becoming a new mom may come easier than others (I have yet to meet a mom that would say that…) but for me and many other moms it was shockingly unexpected how hard becoming a mom would be. Then one day I broke. I laid on the couch, no tears, no drama in my voice, just certainty. I told my husband I was done living and wanted to die. I was finished. The world I lived in was dark and my son deserved so much better than me. I, as a person, did not matter anymore. This is just life now. It’s brutally difficult and joy is non existent. The most important thing you can do for yourself and your family? Women with postpartum depression need help. This article is here to assist you in overcoming depression and anxiety. I always thought depression and anxiety were a state of mind. Until I got postpartum depression after the birth of my son, Titus. I figured the pre-pregnancy Sara could use some chill out techniques and some self help books, but the post pregnancy me had a full blown mental imbalance. I want to tell you that PPD is real, common and very, very hard to get out of. Being a new mom, you have just been through the long, grueling experience of pregnancy. You probably haven’t slept well the past few months. You probably want your body back by now. You probably want to be able to take an Advil once in awhile! After the baby is born, you are thrown into this new life that is so unlike the baby books and anything on TV. I wanted to create this step by step guide on how to get out of the stay at home mom depression slump. You are an amazing woman, and you give 100% of yourself everyday. If your battery is constantly running on empty or your entire day revolves around everyone and everything but yourself, read this. This is a mom that takes on every task and challenge at full throttle, does not stop to rest or eat or take care of herself. To the outside world she is remarkable, but she is tired, worn out and has lost her identity outside of being a mom. This kind of mom puts her all in to her role as a parent, but at what cost? Momma Bear refers to a mom that has probably experienced some sort of trauma during pregnancy or labor and delivery. Maybe a preexisting anxiety disorder was intensified by her new role as a mom. She thinks she needs to hang on to all aspects of her children’s lives with a steel grip. No one can take care of her children as good as she can and she worries constantly about their well being even in a safe setting. Again this probably started with trauma during pregnancy or the first year as a new mom. This mom never got the time to recover, and has been running on auto pilot ever since. The thought of being away from her kids for an hour terrifies her because outside of them, she wouldn’t know what to do with herself. If you have experienced anything similar to the SuperMom, the Momma Bear or the Postpartum Depression Mom, it doesn’t have to be this way. You can be a mom and an individual at the same time! Here is a list to build yourself back up to the person that enjoys life and knows how to exist outside of her role as a mom. 1. Take the depression and anxiety test linked here. If you score high, continue to follow the steps listed in my Depression Help article. Do not skip this step. After you have completed those steps, come back to this guide. If you did not score high, keep reading. I know this is a big task. I want you to put other outside commitments aside for now and spend nap time or the evening tidying and organizing your surroundings. Declutter and get your house feeling fresher. Take your time and remember to eat and stay hydrated. If you do not already have a daycare or babysitter that your child can visit, set this up now. If you feel you cannot afford this, try enlisting a friend or family member. We are talking about ONE day to start. Look on Urbansitter.com, Google, a local Daycare, talk to other moms about who they use. Set this up, do a tour with your child and put a date on the calendar. ONE day. If you identified with any of the 3 Mom terms you saw above, remember that the fear and panic at the thought of your child being at daycare is the ‘Mom term’ talking. Now that you have completed the steps in the depression checklist (if needed) and your house has been ‘simplified’, send that kid to daycare for the day. I want you to give yourself a makeover. Make a coffee, drink it while you do your nails. Have a shower, shave and apply a homemade hair mask. While the hair mask is setting, sit in front of the mirror. Pluck those brows, moisturize and put on perfume. Now rinse that hair mask and do your makeup. Get dressed in normal clothes. Do your hair. Now take yourself out of the house somewhere that would be nice without the kids. DO NOT run an errand. Go shopping, go for a walk. Smile at everyone you see. The point is that YOU did it. You are a person in this world, and a very important one. If you have an early learning center around, go there. If not, look in to churches. Many of them have an open to the public playgroup once a week. When you get there, smile at the other moms. Even moms that look put together may feel just like you underneath that perfectly curled hair. Talk to them. Maybe look for the mom that is alone just playing with her child. Give her a compliment and start a conversation. Keep at this. The point is to get out in the Mom community. When I was suffering with Postpartum Depression, someone gave me this advice. They said to take baby to a playgroup, get out there in the world. I was terrified. I got to the playgroup and sat down a midst the circle of other parents. I saw them all smiling and playing with their kids. Almost immediately the walls started closing in on me. I don’t fit in here! They all look happy…what am I doing wrong? I figured they were all judging how terrible I was at this mom thing, I grabbed my baby and I ran out to my car crying. It is OK to be scared. It is not OK to isolate yourself. I promise you, those other moms don’t care what you’re wearing or how big those bags are under your eyes. And if your baby starts causing a fuss, they will think you are brave and admire your ability to deal with it. Take that babysitter you found earlier and go for dinner. If you are a single mom, ask a friend. On this date night, do not look at your phone for babysitter updates on whether your child finished their grilled cheese or made a poopy. Act silly, laugh, breath, and let yourself relax. Does it say anywhere in anything you have read that Moms should be slaves at home and are not allowed to have fun? No. Do not feel guilty getting a babysitter. Even for an hour. Get out there! Let’s recap. You have identified what type of mom troubles you are suffering from with the defined list of 3 Mom terms. You have checked your mental health with a professional if you are suffering from depression and anxiety. Your house is in better shape, you have cleaned yourself up, and you are starting to venture out of the house without your kids. Great work! I am so proud of you! Remember to stay patient. You probably lost yourself somewhere between pregnancy and the toddler years. That’s a long time! You are not going to feel better after one day. Keep going…. Brainstorm ideas you can be passionate about outside of your kids and partner. Something just for you. Implement an hour a day to do your hobby. Maybe you get up an hour earlier (yuck!) or use nap time. The dishes aren’t going anywhere and blind yourself to any window smudges or dust you may see. Don’t be SuperMom! Avoid isolation. If you feel like you do not want to leave the house, that’s OK for now. But Face-time, call a friend, join a mom forum, just interact with other humans. Stay hydrated. It is easy to neglect yourself with a newborn demanding your attention. Set an alarm on your phone to remind you to drink a glass of water every 2 hours throughout the day. Work on your hygiene. When baby is sleeping, or in the swing, or husband is home, etc. brush your teeth, wash your face, better yet…have a shower! Blow dry your hair and get dressed. Now look in the mirror and congratulate yourself on how well you clean up! Eat something. Some good advice out there is during your pregnancy to freeze already made meals for when you don’t want to cook or don’t have the time. Now is the time to dig through that freezer. PPD may make you feel not hungry, but find a way to nourish your body. Sip on a smoothie, order pizza, whatever! Just eat. Do some skin to skin with your baby. Turn on a good TV series and strip off those clothes. Grab baby and a blanket and snuggle up chest to chest. Get those love vibes flowing and hopefully you can both drift off to sleep in each others arms. I want you to picture yourself as a computer hard drive. Every computer has a hard drive filled with programs, software, internal memory, etc. If you were to make up a pie graph of this hard drive and the things that are taking up space. Now I want you to be that hard drive. Make a pie chart of all the things that take up “You” on a daily basis. Your task now is to find your balance. What is taking up too much of your time and what should probably take up more. Is cleaning taking up a lot of space but personal hygiene or self care is at a 2%? Tweak this pie graph and play with the numbers until it works in your favor. Now print it and put it somewhere you will see it everyday. Work towards this goal because you matter so much. 11. Do You Need Medication? Do not be afraid of medication. If part of your doctors plan of attack for PPD is to start you on an anti-depressant, it may just be exactly what you need. After having been on birth control for a long time, then an anti-depressant in my 20’s, then through the hormonal changes of pregnancy…my brain chemistry was so out of whack that I needed medication. I was not going to come out of depression without it. My medication saved my life and I do not regret starting it one bit. Being a mom is the hardest job I have ever had. It took me 2 years to find myself again after the birth of my son. Remember, this is an ongoing process. Emulate for your children how important loving yourself is. No one benefits from a depressed mother. Invest in yourself and I promise you will be glad you did.